There are reasons why smart car navigation companies use GeoSmart data on their devices. The reasons are that often near enough is not good enough. This week we have seen a good example of this, which was followed up in the news media. On Wednesday the Otago Daily Times published a story with the headline GPS systems send Peninsula tourists off track. It quoted a Senior Constable who said that tourists were being guided onto paper roads and dirt tracks by car navigation systems and certainly into areas not suitable for most vehicles. 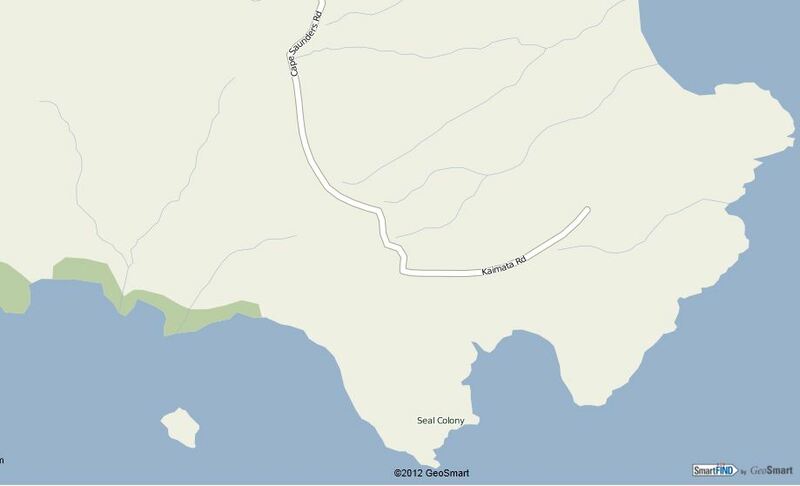 An example given was that people were trying to drive all the way to the seal colony shown on the map here, via Cape Saunders Rd. As you can see on our map, that isn’t possible, but there appears to be a paper road on some car nav products (obviously not using GeoSmart Maps) that say you can. Because we are the premier supplier of quality car navigation map data for New Zealand, the obvious query came to GeoSmart for some clarification on this. We are the market leader in car navigation in New Zealand because of the quality of data. We have quality data because we are local and because we have invested heavily for over 12 years in having quality data for car navigation. We have a map room full of people who are committed to having up to date information on our maps including eliminating paper roads, maintaining speed zones, current information on Points of Interest, turn restrictions such as 1-way streets, no left turns, median barriers and also what we know as implicit turn restrictions, which is where a large vehicle may not be able to safely complete a turn even if it is legal to do so. As a consequence, brands like TomTom and Navman use our information in order to ensure that their valued users do get quality instructions. I received a call from the journalist who wrote a follow up story for the NZ Herald with the headline Don’t just go where the GPS says – if it looks like a paddock it probably is one. I explained that when we first decided to become a car navigation map provider, partnering with brands such as Navman, Siemens VDO and BMW, we processed the Government data (which was never designed for guidance) and found that it was not suitable for car navigation. There were huge numbers of paper roads (roads that have been drafted but not (yet) constructed and situations where entire settlements were 60-80 or more metres away from where the maps said they were. We then set out to drive every public road in New Zealand, getting accurate data with the technology of the day, eliminating the paper roads and at the same time getting key information such as speed zones, road class, points of interest including things like rest areas, ATM’s, public toilets as well as business, tourism and travel, hospitality, sport etc. Today we continue to drive, capturing a road centreline at sub 1 meter accuracy as well as information such as the incline of the road for eco-routing and the angle of the camber on corners for future truck safety systems and of course real time traffic which can be found online at AA Maps, AA Roadwatch and AA Journey Times and is of course used by TomTom and Navman. A key issue that we have identified in recent times is that a lot of car navigation users don’t realise that they need to update their maps regularly. In New Zealand roads are changing continually. They are road realignments, new motorways, new subdivisions, suburbs and settlements being built all the time. Roundabouts get replaced with traffic lights and traffic lights get replaced with roundabouts and it never ends. GeoSmart does a new update each and every quarter, 4 times a year and they are all significant updates. Just because you have a navigation unit that is only 6 months old, doesn’t mean that it has the latest data. Even if you have just bought a unit brand new, it is worth plugging it in to your computer to see if there is a new map available. The acid test is www.aamaps.co.nz. This also gets updated every 3 months. If a road or segment is on AA Maps, then it is in our data and will either be in the latest car nav map for the brands that use our data, or is about to be. If it isn’t on AA Maps, then we are probably adding it, but we would love to hear from you just in case. All you need to do is click on the feedback button on the AA Maps web page, select the type of feedback you want to give us and the information will go to the appropriate team member. We are Kiwis, we live here and we take pride in the quality of our data and want you to enjoy your motoring. Can You Trust Car Navigation? This is a subject that comes up frequently in discussions and one that we all wonder about from time to time. We have been in the car navigation business since it started in New Zealand, first working with Navman and then over the years supporting and providing map data to most (not all) brands, where data accuracy is key. 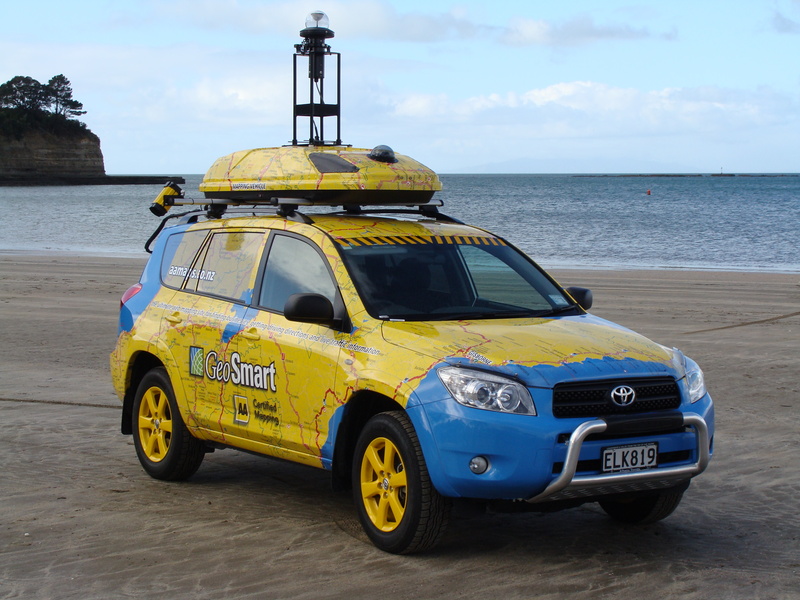 I won’t belabour the point that GeoSmart is the only country that continually drives all of New Zealand in our RapidcV mapping car. If you follow the link above you will see the car not only has many sensors on it, but it also has a pile of cameras. 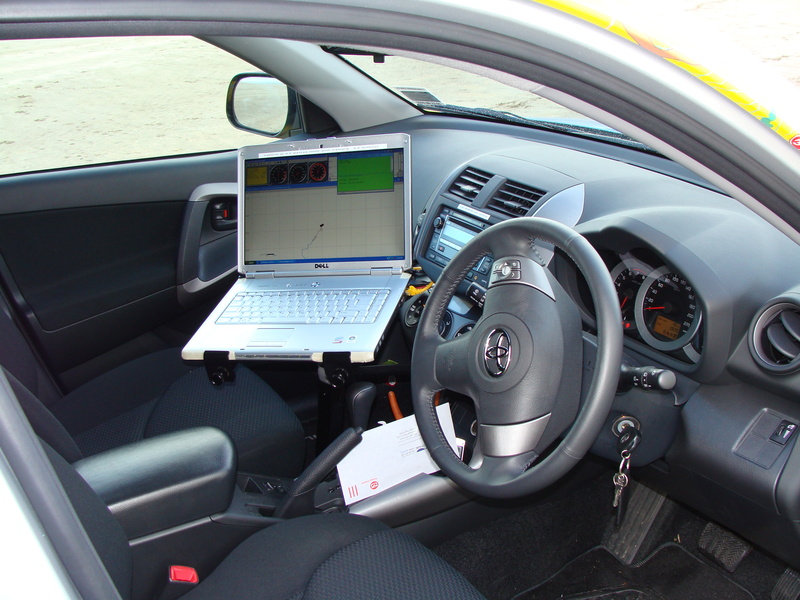 The link explains more about the data the car collects. In Auckland we have a lab full of specialists in a variety of areas including database, cartography, applications development and more. They source data from a wide range of sources including of course the car, data from central and local government agencies, road transport companies, AA members and the public. They collect, validate and manage data all year round and prepare it for quarterly updates, compile it into various formats for different clients and then our database team uses a variety of Quality Assurance tests for up to a month to try to break the data, in effect to make sure it is as near as possible to bulletproof. Then every quarter we ship the updates to several car navigation companies including of course Navman and TomTom. The data doesn’t just include exactly where the road is, but also changes to speed zones (to around 10 metres accuracy), roundabouts, traffic lights,road realignments, subdivision updates and much more. Some examples in recent updates include things like the Victoria Park changes including the soutbound viaduct and the northbound tunnel, the Newmarket Switch. It includes lane data and a huge range of Points of Interest from dump sites for campervans and public rest areas through to a wide range of business and recreational locations. So back to the first question. Can you trust car navigation? The first answer is whilst our data is 100% driven, validated and mapped, map data is constantly changing and we can’t guarantee the exact completeness at any point in time. We provide an update every 3 months and one of the things you need to consider is how up to date your map data is. If your car nav application uses GeoSmart map data, then they have the latest data and most of them offer free map update deals when you buy a new unit and also ongoing subscriptions to keep your map data current. This is very important. 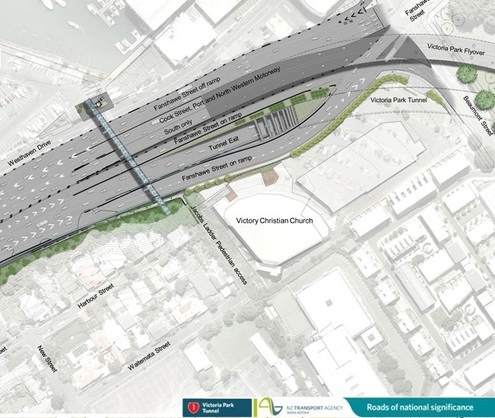 The image here shows the changes to the Victoria Park Viaduct. If you have old maps, there is every possibility that if you are heading south, your navigation will give you misleading directions based on the old road configuration. For example if you have old maps in your car navigation and are heading to SH16 from the Harbour Bridge, you could be told to keep right then keep left. This should see you on the right hand viaduct which does not provide access to State Highway 16. Now you will have a detour to make, trying to work out how to get back on route. This raises one very important point, you must use your navigation as an aid, in conjunction with what you see outside, while you are driving. If your instructions don’t make perfect sense then don’t follow them. We hear stories of people being told to turn into a canal in Berlin, or wedging their trucks between ancient buildings in Britain. Some common sense would have avoided those incidents. Assuming you have GeoSmart Maps in your car navigation system and use common sense, then the answer is, yes you can trust your car navigation system. I have been driving with car nav for over 7 years now and I continue to be surprised that there are times when I think the navigation instructions are wrong, (I believe I also ave a very good sense of direction) and the nav found better ways for me to get from A to B even in areas I know pretty well. Another major factor to consider with car navigation is real time traffic and a number of brands now offer this as a feature. Following is a link to a TV3 experiment where 3 journalists drove from West Auckland to the TV studio. One used TomTom car navigation with HD Traffic (using AA Traffic by GeoSmart), one took the route the locals took and the other followed Google Maps directions. Watch this link to see what happened. I think it proves the point that you can trust quality car navigation devices that have the best current map data. A couple of statements by David J. LePoire drawn from his essay “Beyond (Conventional) Renewable Energy?” caught my eye this morning. He said that “If energy use had grown as fast as the economy, the United States would be using an estimated 60% more energy than it does now. We’ve improved energy use in buildings, electrical appliances, cars and industrial processes. These applications are often motivated by cost savings.” There are often stories about how companies who focus on sustainability in a concerted way will become more profitable as a result, but often there is little information on where the increased profitability will come from. There has been a lot of discussion about how green New Zealand really is and which initiatives are going to help us go forward in the way I believe most Kiwis want toThe elections are close and the parties are all telling us what their policies are going to be. Meanwhile there are many companies who are just working business as usual with an eye to a better future. GeoSmart is one of those companies. So what are we doing? First, we have driven every road in New Zealand for many years, but in the last few years we have been driving with phenomenal technology put together in New Zealand by Kiwis, which allows us to map New Zealand roads to sub 1 metre accuracy even when there is GPS shadow or at times (not uncommon particularly in the South Island) where there is no GPS sugnal available at all for periods of time. Tests show that we tend to be accurate to around 15cm which is as good as I believe you can get without having surveyors and laser theodolites on the ground. This in itself means that we are able to provide highly accurate data to users of our routing web services, such as AA Maps and mobile applications such as Rugby2GO. It means that people will not be sent up paper roads that don’t exist, confirms speed zones and intersection controls and other information that doesn’t always get provided to us by the authorities. Quality routing means that people can get the best routing information to meet their needs. For example the shortest route is often not the fastest. We also collect road inclinometer. That is the rate of incline on hills, of which we of course have many in New Zealand. Our car navigation clients are getting more involved in eco-routing which means you can choose the route which will consume the least fuel. That means that effectively, irrespective of what type of car you drive, you can save money while also helping to save our environment. We are also collecting data about the camber or angle of the corners. Because of the volatile nature of our country with frequent earthquakes, floods and slips, geothermal activity, the condition of corners may change. When a corner changes and noone knows about it, this can be the cause of serious accidents, such as with large trucks and trailors who may be obeying the speed advisory signs, but the conditions have changed since they were set. We are working with sophisticated Fleet Management companies who are going to use this data, combined with their knowledge of their clients’ vehicle set ups, roll over specifications and load information to alert drivers that they may be going too fast for the conditions of the road. This can save insurance conmpanies millions of dollars, not to mention reducing the inconvenience of motorists having to deal with travel delays as the incidents are examined and detours put in place. Another major area for us is real time traffic. 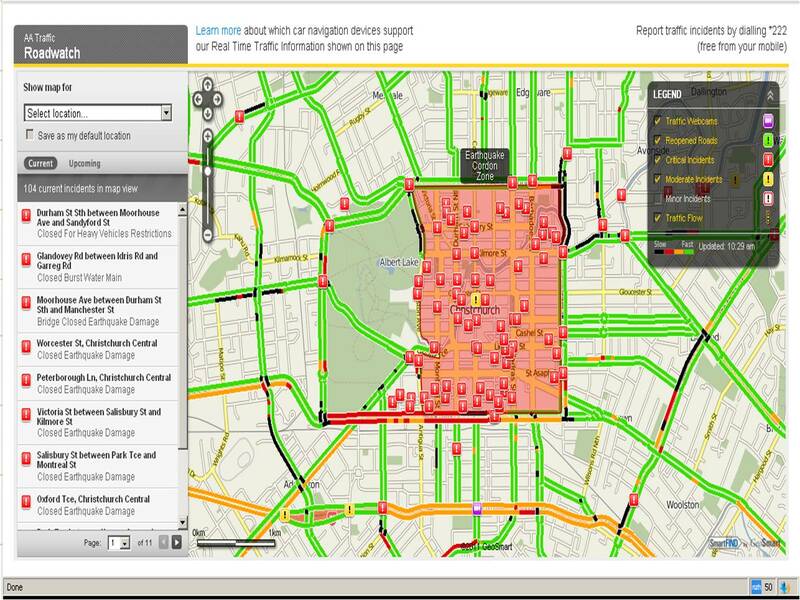 You are probably aware that we built and maintain the AA Roadwatch website and and provide services including real time accident, incident and congestion data throughout New Zealand and Australia to major car navigation brands. 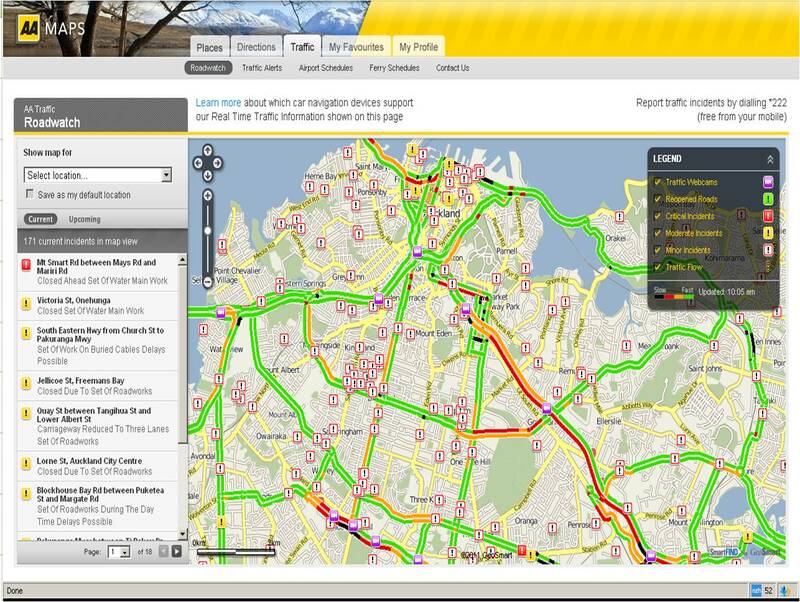 AA Spokesperson Simon Lambourne was quoted in an article in the NZ Herald earlier this week that studies have shown that “when 10 per cent of drivers use real-time traffic information to avoid jams, journey times drop 5 per cent for everyone.” Find out more about AA Traffic by GeoSmart here. Route optimisation is becoming more important. We have written a number of blogs on this topic and more and more companies are coming to us to use this service and variations of it. Essentially if a person has a number of sites to stop at during a day’s work, our SaaS application Route2GO Lite geocodes and calculates the best order to make those visits in, to drive the least amount of time via the most efficient route. This results in increased productivity and reduced overheads. It is also sustainable. Are you able to tell your clients that your business uses technology to benefit the environment as well as the company’s bottom line and provide better service to boot? Talk to us about how we can help you become more sustainable whilst increasing profit. Location is everywhere. A large number of people now use mobile phones which are location aware through a number of technologies, most well known are GPS and GPS Assist. Some location based technologies such as car navigation are now well accepted, so the market has a general understanding of the concepts. There is a chasm between people who use this technology regularly because they are in key industries where the applications have been adopted as a matter of course such as people in ICT and Marketing. Many bricks and mortar businesses such as retail, hospitality and tourism are only barely aware that these technologies exist. Effective use of location or proximity based marketing solutions can have a significant impact on the profitability of many bricks and mortar companies who not only have to compete with each other, but also with Internet based retailers and wholesalers. There are many existing applications such as Foursquare, Facebook Places, Gowalla and more which can be used by these businesses, however most business managers are unaware of the technologies, intimidated by them and to busy working in their businesses instead of on them. This presents significant opportunities for developers and the businesses themselves to take an early adopter advantage. It also displays a need for market education as to the technology and how to use it in each unique business. 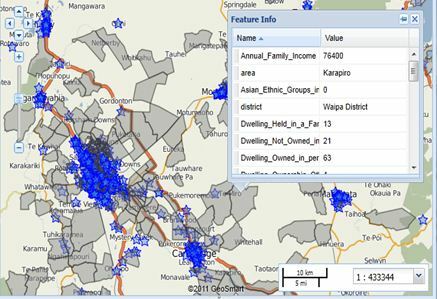 GeoSmart of course has web services and API’s that developers can use to create their own apps, particularly in New Zealand and Australia. I will be exploring these issues over the coming weeks on this blog. Please bookmark or use the RSS feed if this is of interest to you. Every year or so the Consumer Institute does a test of car navigation products and produces their ranking based on a number of criteria. Almost always the top brands are the ones that use our GeoSmart Maps. In this case the top two products also featured AA Real Time Traffic which got a mention. We believe that in future this will become a standard requirement for all quality car navigation products. First, knowing where to go doesn’t help if the road in your path is obstructed or closed due to accidents or incidents. We have had many incidents throughout New Zealand in the last couple of weeks which have caused major delays to motorists who weren’t fortunate to have car navigation with Real Time Traffic to warn them. A recent TV3 News Story with a race including the use of a TomTom Go Live 1000 illustrated that Real Time Traffic can beat conventional routing norms. The latest comparison was no exception to the norm with the top 2 products being from Navman and TomTom, with Navman slightly ahead. These tests are always subjective and we don’t get the opportunity to comment or assist in these tests. I would like to comment on a few items here. Firstly these devices have become highly sophisticated and have a wide range of programming options that make it hard to fairly compare devices. Their algorithms are different and they have features that are difficult to compare directly, its a case of apples versus pears and the best unit in my opinion has to do with the functionality you desire rather than the brand. There was mention on both brands where they were guided to a staff car park at an undisclosed airport. This makes it difficult to respond. We typically provide multiple locations to drive to at major airports, but without knowing what was entered or which airport, we can’t really comment. Several brands including Navman and TomTom use GeoSmart Maps which utilises the same Points of Interest data as used by the popular AA Maps website. This site shows over 40 locations that you can route to just at Wellington Airport, as provided by GeoSmart. Obviously they did make it to the airport and they are all pretty well signposted. There was a comment with TomTom on the Go Live 1000 about the time it took to get a GPS fix. This is ironic because the TomTom Go Live has a SIM Card in it, and therefore has communications and one of the features of it called QuickGPSFix (TM) , is the ability to download the current GPS satellite locations which means that it is designed (if you use the features correctly) to provide very fast location of satellite positions, which is required for the device to function at its best. There was a comment that some of the devices were placed in awkward positions on the windscreen. This is important because in addition to placing the device where it can be easily seen by the driver, it is also important that the device has the best possible access to the sky in order for the antenna to communicate with the satellites in order to determine its position. Apples with apples should see devices being compared being placed in an identical location on the windscreen in the same type of vehicle. There was a mention of a product on Trade Me which came with an illegal wall charger and adaptor. There is a thriving trade of devices typically imported from China that have illegally hacked navigation software and illegal copies of car navigation maps. One of these uses GeoSmart data that is already several years old and whilst the software is good, it is also old an not licensed. Whilst these may look like a good value purchase, the software and maps are effectively stolen goods and this is frequently raised with Trade Me. If you buy product that is new, it should be factory sealed and have a serial number. If it is used or not one of the major brands, ask for a copy of the original bill or receipt. 1. Understand what functionality you are looking for before you buy a nav device. Read the details on the packaging or read information on company web sites and review sites. Often retail sales people just read off the box themselves. Ask them if they have personally used the devices or attended Product Knowledge training by the manufacturer. 2. Real Time Traffic. Have you ever been stuck in traffic? Would you have liked the opportunity to be informed and had options before you started driving, or even during the trip so that you could get where you want to go? 3. If a deal looks too good to be true, it probably is. 4. Today’s nav devices have very good help screens and tutorials. It is worth spending a little time to learn about what it can do when you first purchase your device because a lot of the ‘problems’ are really lack of user knowledge rather than a failure of the device. Today’s top brands have very highly sophisticated features that may be missed by the owners. I noticed that over the weekend someone had located our blog by searching on Google with the query “How to get listed on Car navigation systems”. I’m glad you asked and equally glad you found us because the answer if very easy. GeoSmart provides the mapping information and Points of Interest (places to go) for the major car navigation brands in New Zealand including Navman, TomTom, Garmin Asus, Metroview and more. In addition to this, we also provide data for lots of other services including cartography and web mapping. The most popular web site we provide data for is AA Maps, which has huge traffic both domestic and international due to the affiliation of the NZ Automobile Association with other motoring associations around the world, so many tourist coming to NZ plan their NZ travel on that site. There are many more of course and some of these are showcased on our home page. We are also finding many new clients in the mobile space, developing applications for iPhone and Android. They also use Points of Interest, so if you list with us you are very likely, if relevant to find your details on those applications as well, again at no charge to you. Simply follow the instructions that follow, which will allow you to quickly and easily add your business to our database for free. You will have the ability to accurately identify the location of your business and chose from a selection of categories that represent your business, which is frequently multiple categories. For example a restaurant may also be a cafe and a take away. We will then validate your listing to ensure that you are authorised to make the entry on our database. Your data will then quickly be added to our data which is then updated by our clients and partners including the major car nav brands. You will also be given the option of a free dynamic map with pan and zoom tools that you can post on your website for free. If people want driving directions to your location they can enter their starting address and be guided via AA Maps with full printable turn by turn directions and maps and even be able to check the real time traffic conditions before they go. All we ask in return is that you log onto your page and ensure your data is up to date at least once a year. What if you are a chain? No problem, as long as you are authorised to represent your business, you can add as many of your business locations as you wish. Hopefully as a chain, we already have your data, but you may have new branches that we haven’t been told about, or some may have moved location, so please check on the AA Maps website to confirm we have all your current info. Now that you will be listed on car navigation and in other applications, you can let people know in person, on your website, newsletters and other material, how they can find you. We look forward to helping send business your way. In this morning’s NZ Herald, senior AA Analyst Mark Stockdale was quoted By Mathew Dearnaley as saying that there may be further pressure on petrol prices this week. The article pointed out that only part of the oil price increase has been passed on to consumers and the tense situation in Libya and other parts of the Middle East mean that the barrel price of oil could continue to increase dramatically. It is clear that we have now well and truly crossed the psychological barrier of $2 per litre of 91 Octane petrol in NZ and I would be surprised if we drop below it again even if Saudi increases their oil production as suggested. AA’s Mark Stockdale made some good suggestions on ways to save fuel, all of which made good sense, especially if you own your vehicle and are paying for the fuel yourself. I’m not saying they don’t make sense for all vehicles, but if the cost comes from your own back pocket and we have now crossed the psychological $2 barrier companies are also going to feel the pain and need to look at ways of saving money on their vehicle running costs. You will remember the story of how to cook a frog. In 1869 Friedrich Goltz demonstrated that if you put a frog into a pot of water and heated it very slowly, the frog would not attempt to escape. Why he was doing it was another story which you can read here. The anecdote is important because we haven’t fundamentally changed our driving habits. Many of us have lead feet and as lovers of driving and fast cars, users of air conditioning and other features, we waste a lot of fuel. Perhaps the new price increases will make us jump out of the boiling water and modify our driving behaviour. Many companies have been driving smart for some time. For example, large commercial fleet companies have been running with Fleet Management solutions using GeoSmart Maps for years. Many get total ROI from being able to claim Road User Charge RUC Rebates, which is being able to prove when they are driving on private roads or property. That means that the added benefits are free. Fleet Management uses technology to monitor many aspects of driver behaviour with a view to being able to improve driver training. For example it can monitor aspects such as harsh acceleration and braking, idling time is another aspect that consumes fuel. Car Navigation is another tool that has been under rated. But lets look at some facts. If it costs over one dollar per km (before the latest fuel price hikes) to drive a relatively small vehicle (not counting staff costs and other items), what does it cost to run commercial vehicles? Can you afford to pay people to drive in circles looking for their next stop? 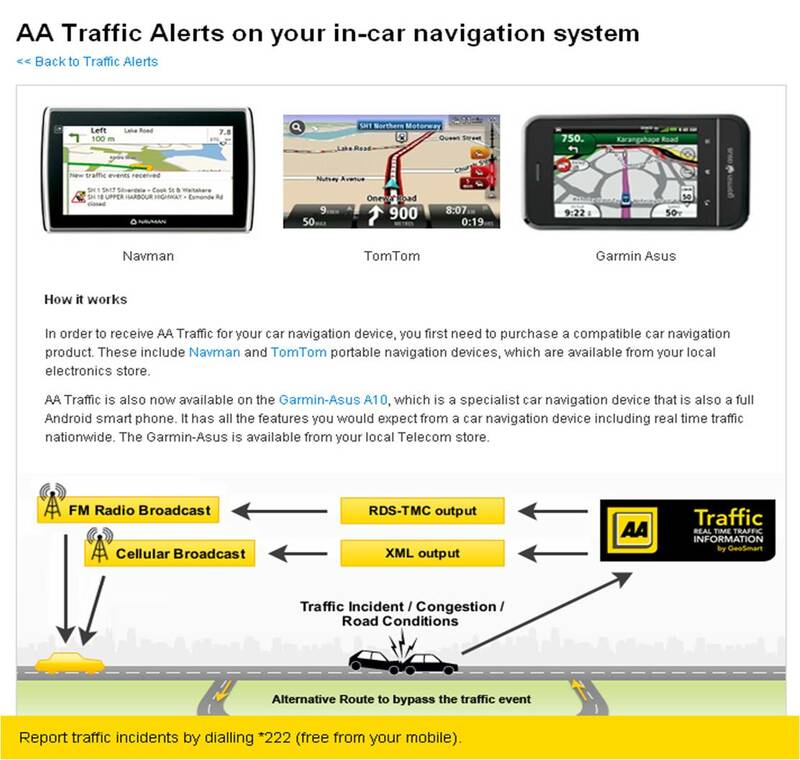 A new feature in car navigation that we have blogged about before is AA Real Time Traffic. 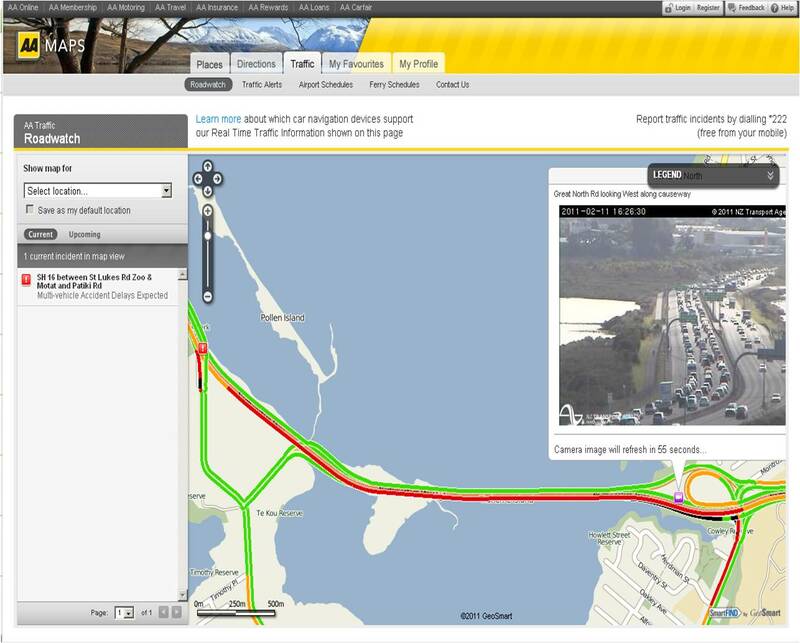 This is a service that provides real time information advising of accidents, incidents and real time congestion covering all of New Zealand. This service is available on AA Maps, AA Roadwatch and as well as TXT and Email Alerts. What is really exciting is that you can now get this information direct to you car navigation devices including selected models from brands including Navman, TomTom, Garmin Asus, and Pantera. This page shows how it works. If you consider how much time you have spent in congested traffic, wouldn’t it be great if you could be informed about incidents before you get stuck behind them. Note AA Traffic doesn’t just cover State Highways, it covers all arterials as well, so only really leaves out small residential streets. We are now discussing how to get this information into the Fleet Dispatch rooms of freight, distribution and service companies who are managing vehicle fleets and could better manage their operations if they can see their vehicles and the traffic incidents concurrently on the same map. You may have noticed a number of references to the NZ Automobile Association. We are a wholly owned subsidiary of the NZAA and as such are very much involved in helping NZ motorists, consumer and business and the initiatives in this blog outline many of our activities in this space. Route Optimisation is another tool that has suddenly gained popularity. GeoSmart has offered these services for around 5 years. In effect the concept is that if you have a number of vehicles, we can tell you what order they should do their stops in, in order to drive the least distance and time. This doesn’t just take the shortest route, it takes into consideration aspects such as which roads have the least number of stops, the speed zones, the angles of corners, turn restrictions and more. It is a complex and involved problem which we have automated into an application that can be run from a web browser on a pay as you go basis. We blogged about this last week when we first heard of the $2 jump. We made the offer of a fee trial whereby we will use Route2GO for free over up to 5 previous runs to allow you to compare the route driven, with what our recommendations would be. Many of the results have been astounding with time improvements of between half an hour and 2 hours on a run, with significant savings in fuel and other overheads, as well as the ability to do more work in the same day without an increase in fixed overheads. That offer is still available and of course the payback is now significantly increased. So, if you have company vehicles that are more than just commuters, you may like to contact us and have a chat about how we can help. You can email us for information or a flyer or contact me (Luigi Cappel) direct on 09 9668768. We would love to help you save money, increase productivity and profit and remain competitive in the marketplace. Many companies will be forced to increase their prices and this will of course impact on inflation. On the other hand companies who work smarter could keep their prices the same or in some cases even reduce them. Historically those companies have increased their market share and in some cases taken over weaker competitors who didn’t think smart. There are a few choices. One of them is to suffer and complain, the better one might be to contact us and see how we or are partner companies can help you prosper despite the difficult times. I like the saying that there are 3 types of people and businesses. Those who make things happen, those who watch things happen and those who wonder what happened. Which are you? Our AA Traffic team has been flat out updating road closures and incidents in our system for the AA Maps and AA Roadwatch websites as well as car navigation (specified models of Navman, TomTom and Garmin Asus) and subscription alerts nationwide, but have also done a lot of work to provide quality information for the Canterbury area. This includes the Earthquake Cordon Zone. Its well worth bookmarking if you are travelling around the area as where possible, we do also include real time traffic flow. 1. All Road condition reports for Christchurch is provided to the AA by a number of 3rd parties . 2. As all of these Agencies in the Christchurch area are inundated with Earthquake recovery, the information we are receiving may not be current. 3. We are unable to guarantee accurate driving directions for the Christchurch Area as conditions are changing rapidly. 4. Our advice to all motorists is not to drive in the earthquake affected areas unless absolutely necessary. 5. Expect significant delays and ensure all precautions are taken to avoid accidents. Are you developing applications for mobiles such as iPhone, Android or Windows Phone 7? Do they have a location aspect to them? If so, we would like to help and perhaps partner with you. We have the only fully driven road centreline of all roads in New Zealand and a range of web services and API’s designed to help you with your application development. No maps aren’t all created equal and while overseas companies offer maps of New Zealand, if accuracy and quality is important for your application you might like to read on a little. The New Zealand road network was originally designed in Scotland in the 1800’s. Many of the roads were never constructed, but they have a legal status and are known as Paper Roads. These roads have a legal status and therefore exist to some degree on traditional map datasets used by many mapping companies. This of course produces many problems when it comes to providing turn by turn driving directions, whether that is in car navigation or in an application that provides directions. Imagine driving at night or in bad weather and being told to turn right into a farm paddock or perhaps through a farm gate. If your application is providing linked directions from A to B and part of the sequence doesn’t make sense, you have a problem, Houston. There is no cost for a Developer Agreement and we have a number of commercial models based on the opportunity. 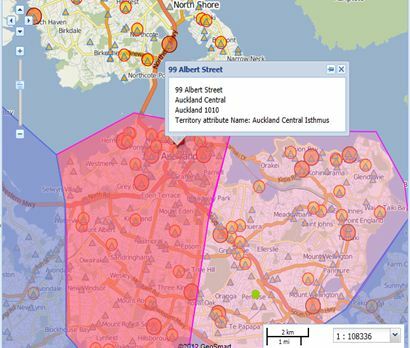 If you are developing an application that is location based in New Zealand, we would like to help and we know New Zealand best because we have driven every public road and many private roads in the country.That’s why when companies such as TomTom, Navman, NZ Automobile Association to name a few, who are not prepared to compromise on quality and accuracy come to us. To see more sites developed using our API’s and Web Services, check out the Showcase sites on our home page for some examples. if you are looking at building location based apps of any sort, for browser or mobile, contact us now so we can discuss how we can help.